Steelbook and metal case collectors can be a fussy bunch, always obsessing over keeping their Blu-ray cases in pristine condition. That’s not without good reason, however. What’s the point of buying a Blu-ray in fancy packaging if that packaging is somehow damaged or flawed? It doesn’t help that these metal cases, despite the tough-sounding names, are terribly prone to scratching or denting easily. Collectors who’ve sprung for the Target-exclusive metal case edition of ‘Iron Man 2‘ should be warned that a significant number are shipping from the retailer with dents and dings before they even get into buyers’ hands. Is there any movie franchise more aptly suited to metal packaging than ‘Iron Man’? The first film’s Blu-ray edition was granted a Steelbook release courtesy of Futureshop in Canada. While it might have been nice to get a matching Steelbook for the sequel, we will have to make do with Target’s limited edition MetalPak. Some collectors are absolute Steelbook purists, but I’ve never found there to be terribly much difference between the three major types of metal disc cases: Steelbook, IronPack, and MetalPak. They have slightly different sheens, and I suppose that the MetalPak has a clunkier-looking design to the outer spine area compared to the other two. But they’re all pretty much the same thing when it comes down to it. Other than the spine, the ‘Iron Man 2’ MetalPak is a handsome case. As far as I’m aware, it’s the first metal case with lenticular artwork permanently affixed to the front cover, and that integrates nicely. In addition to being 3-D, the image is a better design than the standard retail cover. The inside of the case opens to a two-panel “Hall of Armor” spread showing off Marks I – IV of the Iron Man suits. Target’s edition is a 3-disc set with Blu-ray, DVD, and Digital Copy. Since its release last week, I’ve read several complaints in the site forums about people receiving copies ordered online that were dented upon arrival. Those who’ve shopped in stores have also reported needing to sort through multiple copies to find one undamaged. I didn’t give it much thought. Issues like this often get blown out of proportion, and I’ve usually had good luck in the past. Since there isn’t a Target convenient to my area, I ordered online. Well, the disc arrived, and sure enough there’s a pretty significant dent on the back cover along the spine edge. Dammit. I don’t know who’s to blame here. Is this a problem happening at the manufacturing factory, at Target’s warehouses, or with the transport and shipping services ferrying them from one to the other? Could be any of these, or all. Regardless, the issue seems to be prevalent enough that it’s worth mentioning. The take-away from this? 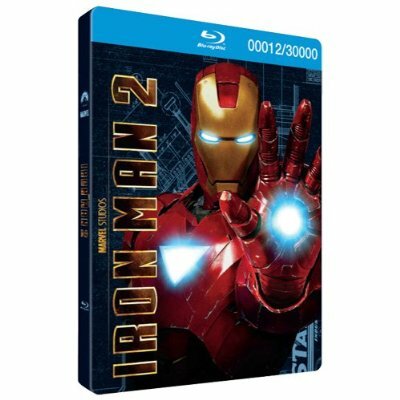 If you’re interested in the ‘Iron Man 2’ metal case and haven’t already bought one, I recommend shopping in-store first so that you can inspect the condition of the case before purchase. If you order online and receive a damaged copy, try exchanging it at a store. If there isn’t a Target in your area, or all those near you are out of stock on the metal case, then your options are a lot more limited. You can try contacting Target for a mail order exchange, but it’s very possible you might just get another damaged copy in return. Fortunately, the dent in mine isn’t so bad that it detracts much from the aesthetics of the case. It’s not really even noticeable unless I hit it with the light just the right way. I might be able to (gently) hammer it out. If it doesn’t bother me too much, I’m not going to stress about it. I don’t buy these things to resell them, anyway. Still, for a $36.99 exclusive promotional product, you’d think that Target would try to take better care of its merchandise.